Get Bennett Onboard and Adjust your Attitude! Classic hydraulic tabs are ideal for boats that stay in the water, requiring high speed action under extreme marine conditions. Choosing the right sized trim tab for your boat depends on power, engine configuration, weight distribution, the type of boat and how it�s used. With more options than any other trim tab manufacturer, Bennett is ready to help you select a size and style that fits your needs. Bennett actuators are strong, flexible nylon/fiberglass hydraulic cylinders that push the tabs into position. All hydraulic lines and wires are internal, concealed by the upper hinge, so they�re not exposed to harsh environments. The HPU is a compact, powerhouse pump that creates hydraulic pressure to operate the trim tabs. What size trim tab is right for me? Many factors affect the choice of properly sized trim tabs, and the ultimate responsibility for selection is up to you, the boat owner. To help you decide, Bennett Marine offers you a few guidelines below. If you still have questions about the size you need, just contact us and we�ll be happy to walk you through it. These sizing recommendations are based on average performance. Your choice may vary based on power, engine configuration, weight distribution, type of boat, and use. The greater the surface area, angle of deflection and/or speed of the water flowing under the trim tab, the greater the lift. When making a choice between trim tab sizes, remember that the largest trim tabs that will comfortably fit on the transom will be the most efficient. As a rule, choose at least one inch of trim tab span (per side) for every foot of boat length. (Examples: 22-foot boat = no less than 24″ x 9″, 36-foot boat = no less than 36″ x 9″. Choose the approximate tab size for your boat using this sizing chart. 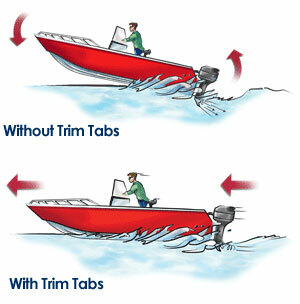 Make sure the tabs will fit your transom using the diagrams below as a guideline. When measuring, disregard the strakes and follow the Vee of the hull. The sizing guidelines below are intended to assist in the selection of tab sizes for vessels that do not currently have tabs installed by the boat manufacturer. For assistance with unique applications not outlined below, please call us. 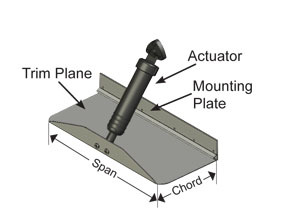 Why do I need Trim Tabs? You may not be familiar with them, but you�ve probably experienced the problems that trim tabs solve for boaters all over the world. After using Bennett systems for years � and discovering just how durable and serviceable they can be � our customers can�t imagine boating without them. Do These Conditions Sound Familiar? As your boat slows from maximum speed, it begins to settle at the stern or �squat,� creating an inefficient, untrimmed condition. At this attitude you use more fuel to drive the boat. As the boat pushes forward, it creates a �hill of water.� In this bow-high position, visibility is limited and the hull bottom is pounded. Also because of significant hull drag and extreme prop angle, fuel economy is poor. Uneven weight distribution makes your boat harder to handle, even harder to get up on plane, and it causes your boat to list to one side. Your passengers complain when you tell them to move from one side to the other. As a boater you know that no two boating days are ever alike thanks to ever-changing weight, weather and water conditions. Bennett Trim Tabs are designed to adjust for these changing conditions and provide lift in order to give you the best possible running attitude. Did We Mention Savings on Fuel? Maintaining plane at a lower RPM is where the boat starts to achieve its maximum efficiency. Trim tabs provide the additional lift so that the throttle can be decreased without losing plane, adding both fuel economy and range. Some boaters have experienced as much as 30% fuel efficiency gains. With all the advantages and efficiencies created, Bennett Trim Tabs virtually pay for themselves. Turn a teeth-jarring experience into a more comfortable ride. Bennett Trim Tabs are one of the few boat accessories that can pay for themselves. Some boaters have experienced as much as 30% fuel efficiency gains. Relax at the wheel thanks to greater control over your bow high position.